The new ATS 503 eliminates the hassle of handling plugs or electrical cords to transfer power. 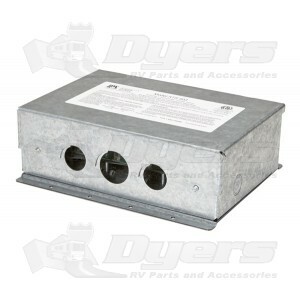 Designed for 120/240VAC 50 amp service. - Large robust relay coils to maintain position during transfer switch operation while the coach is in motion. - Heavy duty galvanized steel chassis. - Shore/utility power is the default power source while the generator/alternate serves as the “takes command” power source. - Reduced arcing and system voltage dropouts prevent damage to your equipment. - Heavy duty, high performance contacts. - Excellent relay and PCB protection against damage. - LED diagnostic self-checking indicators. - Control board provides capability for future expansion and easy to wire/install.